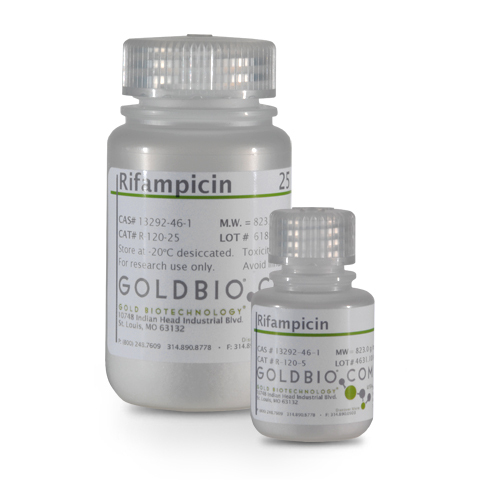 Rifampicin is a broad-spectrum antibiotic known for its efficacy against tuberculosis and other infections caused by Mycobacterium species. 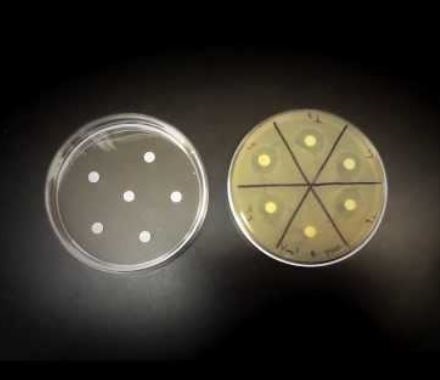 This semisynthetic antibiotic has also been shown to work against methicillin-resistant Staphylococcus aureus (MRSA), to activate nuclear pregnane x receptor (PXR), and to promote CYP2C-mediated metabolism. Rifampicin functions by binding the β-subunit of RNA polymerase, inhibiting RNA synthesis. Resistance to this antibiotic develops from mutations on the binding site on RNA polymerase leading to a lower affinity for rifampicin. TESTED AGAINST BOTH SENSITIVE AND RESISTANT CELLS AT GOLD BIOTECHNOLOGY LABS. Soluble at 50 mg/ml in DMSO or up to 16 mg/ml in Methanol.